Oystercatcher fledglings find a comfy hideaway. Conservation groups around the Island are struggling to protect piping plovers and other shorebirds from an abundance of skunks and crows, which have learned to seek food on Island beaches during the summer. 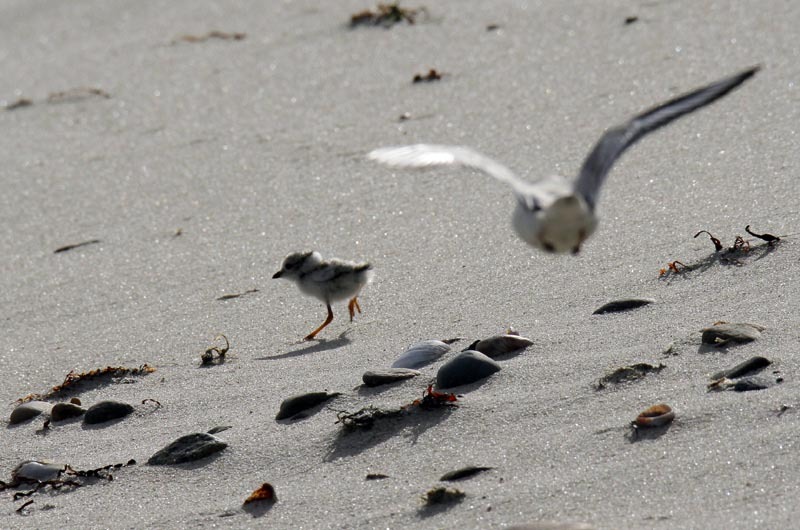 Piping plovers are federally protected, and, along with least terns, are considered threatened in Massachusetts. 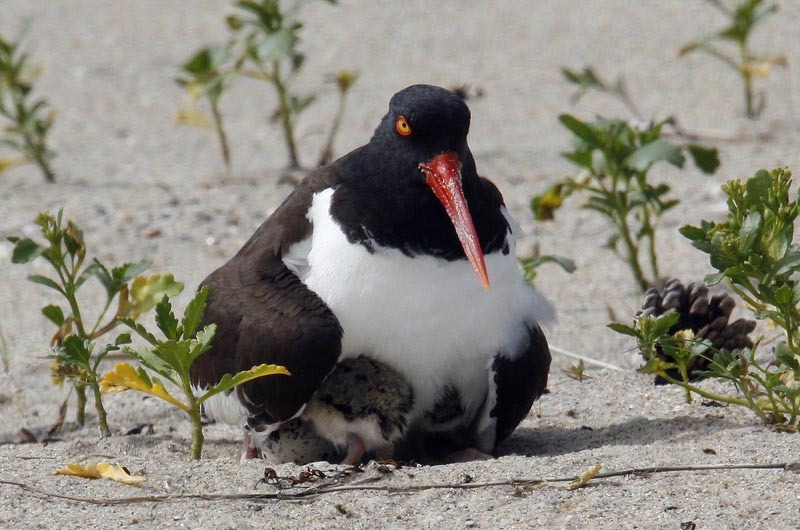 American oystercatchers are closely monitored as a vulnerable species. 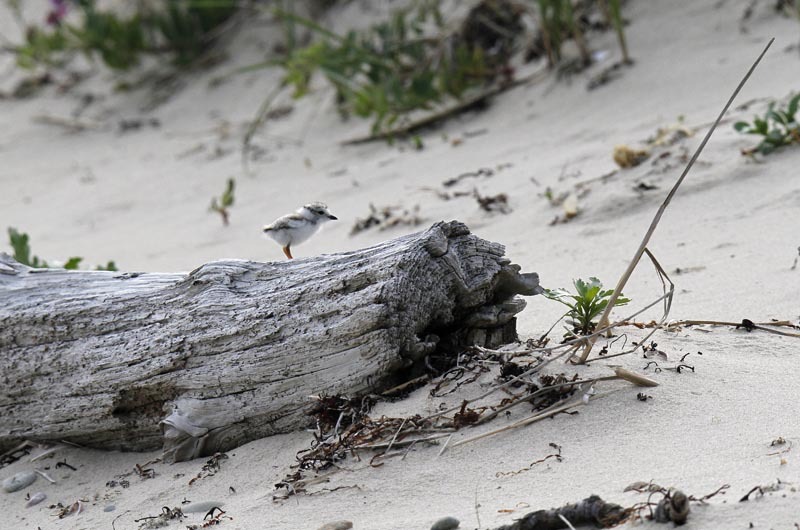 Despite efforts over the last three years to more actively manage the nesting sites on Vineyard beaches, the overall survival rate of plover chicks has consistently fallen short of the 1.21 chicks per year needed to sustain the breeding population. Historically, plovers have suffered from a loss of habitat — the trampling of nests by humans, dogs and vehicles, and from predation. On the Vineyard, the main threat is the abundance of predators, especially crows and skunks, whose populations have grown along with human development. For the nesting shorebirds, which lay their eggs directly in the sand, “It’s this great habitat, it attracts the birds in, and then they just get pummeled sometimes with predators,” said Luanne Johnson, director of Biodiversity Works in Tisbury, which monitors about half the nesting sites on the Island. 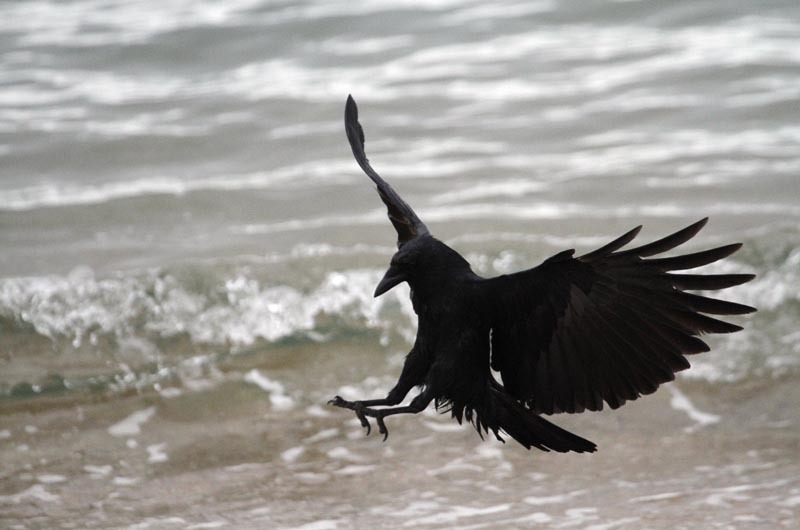 Russ Hopping, ecology program director for The Trustees of Reservations, which manages nesting sites on Chappaquiddick and the south and north shores, as well as on the mainland, agreed that crows were a major problem. “They adapt very quickly to their environment and new food sources, but they can also adapt quite quickly to any efforts to control them,” he said. Seagulls are a problem as well, he said, but they are nearly impossible to control. This year, Biodiversity Works removed 12 skunks and two crows. It also captured four cats, which it gave to local animal shelters. The Trustees of Reservations removed three crows and four skunks. The animals are captured using box traps and euthanized with carbon dioxide, following American Veterinary Association guidelines, Mr. Hopping said. Crows can learn to avoid the traps, however. They also have learned to wait around the enclosures for the chicks to hatch. A group of “chick sitters,” mostly retired or semi-retired Islanders, volunteer to watch the nests in the early morning and late afternoon during nesting season to keep the crows away. Another option for managing the crows involves lacing some eggs with a toxin that targets members of the blackbird group. Ms. Johnson said that option would be expensive and would require a permit from the USDA. She emphasized that the first line of attack is to keep predators away from the nests to begin with. Managing plovers and other shore birds requires multiple approaches, and the right mix depends on each site, she added. Enclosures are usually effective in protecting the eggs, for example, but they also provide opportunities for birds of prey and wild cats to kill the adults. Hawks and falcons can perch on the enclosures, and cats can hide behind them as the adult birds come and go. Along the south shore, where birds of prey are more abundant, the enclosures are used less often. “The south shore, I have to say, has been dismal for a while now,” Ms. Johnson said. 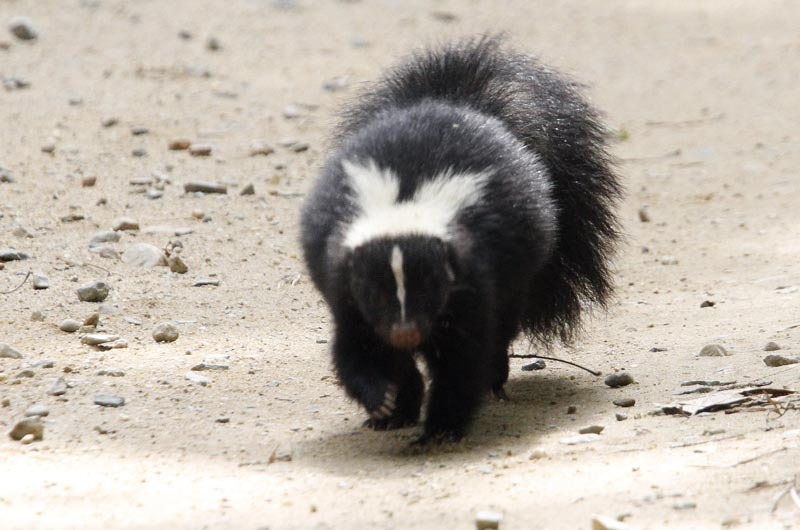 “No one is getting any chicks off the ground along the south shore, due to pretty high levels of skunk and crow predation,” she said. At Lighthouse Beach, a low fence extending into the water has helped to divert the skunks and protect the plovers, least terns, oystercatchers and other birds along Little Beach to the north. The terns themselves helped protect the plovers by swarming and driving out any intruding crows. Mr. Hopping said that the Trustees have not observed any dogs attacking plovers on the Island, but he said their presence alone causes distress among the birds. “The birds just see a predator,” he said. Summer beach traffic can be an even bigger factor in chick survival if a spring storm washes out a nesting area and forces the season further into the summer, Ms. Johnson said. But that was not the case this year. “We just ended up with a lot of predation in general and it was consistent across the season for us,” she said. Several groups, including Biodiversity Works, The Trustees of Reservations, the Mass. Audubon Society’s Coastal Waterbird Program and the Martha’s Vineyard Land Bank, have begun discussing ways to better understand the predator problem. They will continue meeting this winter to find new ways to collaborate and integrate the different strategies, especially during the spring.